Amazon recently announced that, for some titles, the company will allow consumers to buy, at a discount, an e-book edition of a book that they are buying in print. Better still for authors: Readers who already own these titles in print will also qualify for discounted e-book versions! Called Kindle MatchBook, this is a new benefit that gives customers the option to buy—for $2.99, $1.99, $0.99, or free—the Kindle edition of print books they have purchased new from Amazon. Print purchases all the way back to 1995—when Amazon first opened its online bookstore—will qualify once a publisher enrolls a title in Kindle MatchBook. 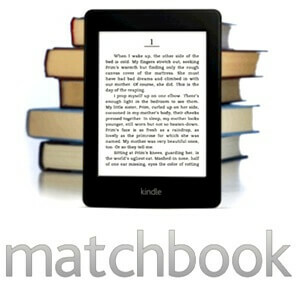 Over 10,000 books will already be available when Kindle MatchBook launches in October, including best sellers like I Know This Much Is True by Wally Lamb, The Art of Racing in the Rain by Garth Stein, The Thorn Birds by Colleen McCullough, A Prayer for Owen Meany by John Irving and The Hangman’s Daughter by Oliver Pötzsch, with many more titles to be added over time. For readers who love their Kindle convenience but like to have their favorite authors’ books signed and on the bookcase, it’s a natural. Kindle MatchBook will launch with books from Ray Bradbury, Michael Crichton, Blake Crouch, James Rollins, Jodi Picoult, Neil Gaiman, Marcus Sakey, Wally Lamb, Jo Nesbo, Neal Stephenson, and J.A. Jance, among others. In addition, Amazon Publishing will include all its titles in Kindle MatchBook. Authors and publishers using Kindle Direct Publishing (KDP) can enroll their books in the program today by visiting http://kdp.amazon.com. So tell us, authors – what do you think of the new bundling plan? Another great post. I love your option to SEND TO MY KINDLE. KUDOS & many thanks! I signed up for Kindle MatchBook and they will let me know when it is underway. One thing I don’t understand. If they sell the book for .99 to a reader, do I pay the amount to have it printed? I love to have a copy of books I read on Kindle. I think it is a great idea as long as I don’t loose money by paying to have them printed for the buyers. What a terrific idea! I will definitely participate with my author’s books. Not only will it be good for the reader but it can help increase an author’s sales. A true win/win for everyone who participates. In a world of dwindling royalties, how much is amazon go g to keep from the authors heavily discounted second purchase? According to Amazon’s page: Your royalty will be based on the Promotional List Price you set and your selected royalty option. For example, if you are earning a 35% royalty for sales of your digital book at its regular Digital List Price, you will earn a 35% royalty on Kindle MatchBook sales calculated at the Promotional List Price.